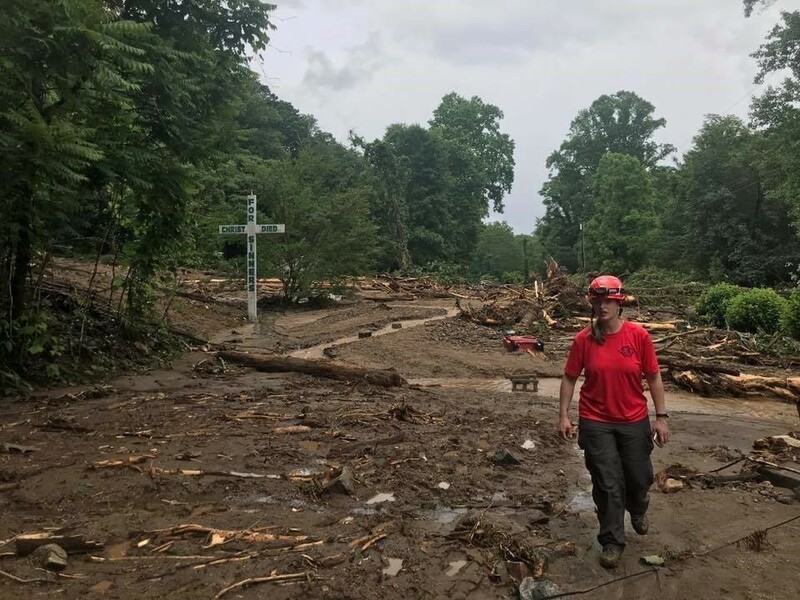 A woman with a disaster relief team walks along the wreckage of N.C. 176 in Polk County in May, after a series of storms caused mudslides that took out buildings and roads in the region. Courtesy of Polk County Emergency Management. 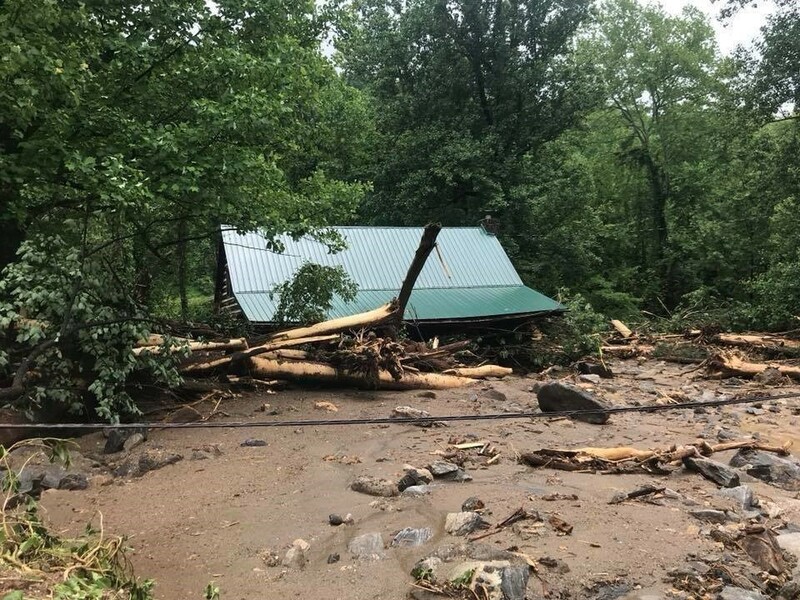 Western North Carolina communities counting on federal aid to help repair damage caused by May storms were disheartened by last week’s Federal Emergency Management Agency decision to deny Gov. Roy Cooper’s request for federal assistance. As Carolina Public Press reported ahead of the announcement, the decision hinged on whether FEMA recognized the rain events in May as one or two disasters. FEMA’s official denial letter, signed by Administrator Brock Long, stated the agency was treating the damage as being caused by two separate events. “Based on our review of all the information available, it has been determined that the damage identified in your request resulted from separate and distinct events, none of which were the severity and magnitude as to be beyond the capabilities of the state and local government,” Long wrote. 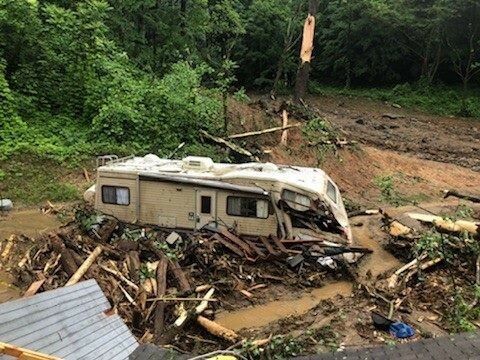 A recreational vehicle sits stranded after mudslides caused by heavy rains in Polk County in May. Courtesy of Polk County Emergency Management. 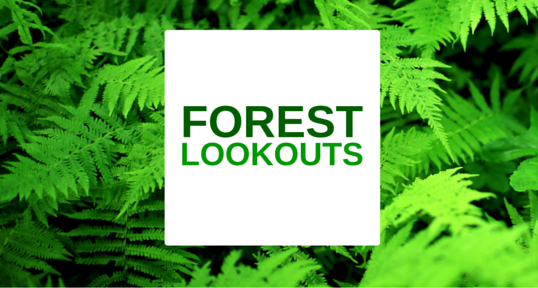 This decision comes after North Carolina has already been approved for assistance from other federal programs, including the U.S. Department of Agriculture and the U.S. Small Business Administration. Though this assistance provided some relief, it did not cover all damage in the 13 counties for which Cooper had requested assistance. “Five people died as a result of these storms, and many other suffered damage to their homes and businesses,” Cooper said in a press release. The state has 30 days to submit an appeal and is working on the request to send back to FEMA. A Polk County home is partially submerged after a mudslide in May. Courtesy of Polk County Emergency Management. Courtesy of Polk County Emergency Management. Mayor Steve Little of Marion said he was disappointed in the outcome. Though Marion has made some progress in cleaning up, the cost is putting a burden on the city. According to City Manager Bob Boyette, if FEMA does not reverse its decision, the taxpayers of the city will be forced to pay for the damage. According to a report from the city, the total damage incurred by the city amounts to $178,000. The state can help pay for some of that but can only grant up to 75 percent. If FEMA approves aid, the full cost would be covered. Polk County Manager D. Marche Pittman said his county has already absorbed the cost for the damage, but individuals are still reeling from the destruction. The county was able to pay for personnel and equipment used for cleanup but still needs money from FEMA or the state to cover damage for residents. At a recent Board of Commissioners meeting, $15,000 in donations from PSNC and Duke Energy was appropriated to a local nonprofit to help Polk County residents. Pittman said this type of work is all the county could do without further assistance. “The best outcome would be FEMA reversing their incorrect decision, which was based on technicalities, and providing the financial support needed by the state and local governments,” Boyette said. 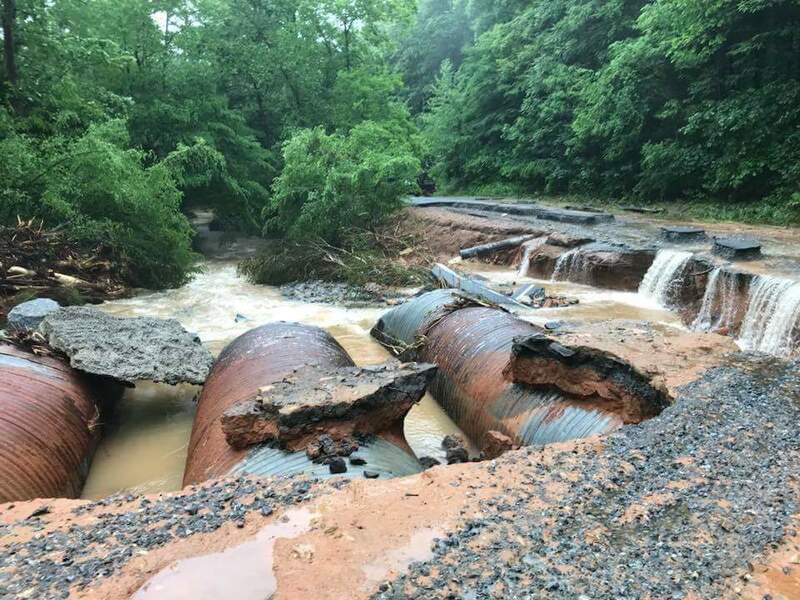 Water runs off the ruins of a highway in Polk County around damaged pipes following heavy rains that struck the area in May. Courtesy of Polk County Emergency Management. 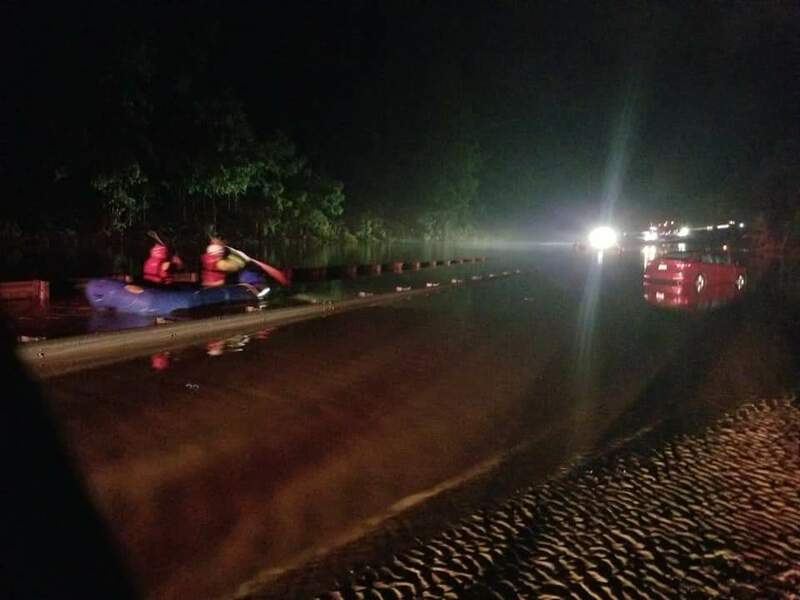 Emergency teams approach flooded areas by boat in Polk County in May. Courtesy of Polk County Emergency Management. Unlike many others, we aren’t owned by umbrella organizations or corporations. And we haven’t put up a paywall — we believe that fact-based, context-rich watchdog journalism is a vital public service. But we need to ask for your help. 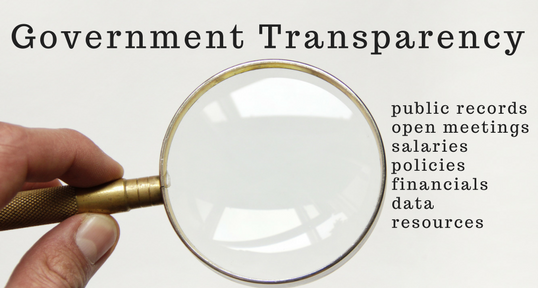 Carolina Public Press’ in-depth, investigative journalism takes a lot of money, dedication and hard work to produce. We are here because we believe in and are dedicated to the future of North Carolina. So, if you believe in this, too, please take a moment to make a tax-deductible contribution. Your gift could be DOUBLED right now. It only takes a minute. Thank you! 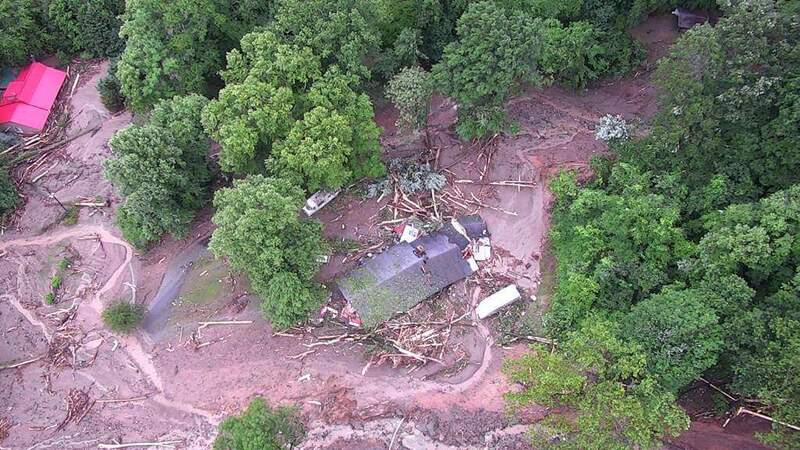 This aerial image shows homes in the path of a mudslide in Polk County in May. Courtesy of Polk County Emergency Management. Karrigan Monk is a contributing reporter to Carolina Public Press. Contact her at karriganmonk@gmail.com.